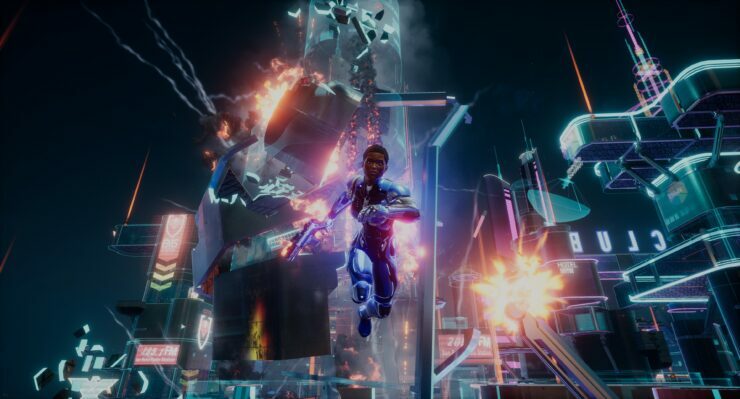 Earlier this month, during the X018 event in Mexico City, Microsoft provided an updated (albeit brief look) at Crackdown 3 and specifically at the much-hyped Azure cloud powered multiplayer mode, Wrecking Zone. The mode will launch with three modes next February. However, none of these will be designed for large-scale combat or Battle Royale action as some fans had requested. In a recent interview with Windows Central, Jorg Neumann (Head of Production for Global Publishing at Microsoft) pointed out that the current five-versus-five modes have been chosen partly due to memory limitations. We prototyped a bunch of modes. We have all kinds of dreams how this can take off. People were asking about Battle Royale, “why aren’t there 100 players?” There’s a reason we have five versus five, and the map sizes too. There’s so much stuff that you need to keep in memory, due to the destruction, that there are limits. Once you have a map that is a nice size and creates the pace of destruction the way we dreamed of it, having more players can be counter-productive, but we’re still experimenting, the tech will evolve too. Of course, there are also design concerns to consider. Would it be a fun experience if, say, a hundred players all had superpowers and could level a city upon each other? Not necessarily. As they say, bigger does not mean better. Crackdown 3 is out February 15th, 2018 on Windows 10 PC and Xbox One, available at launch on Xbox Game Pass for all subscribers of the Netflix-like service. PC owners will have to meet or, preferably, exceed the following system requirements.